Here’s what’s up in the world of TV for Tuesday, February 14. All times are Eastern. Girlfriend’s Day (Netflix): It’s unclear what exactly the holiday of the title entails, but we’re assuming this new indie film from Bob Odenkirk will be a darker alternative for anyone who prefers their Valentine’s-Day candy laced with a little bit of poison. 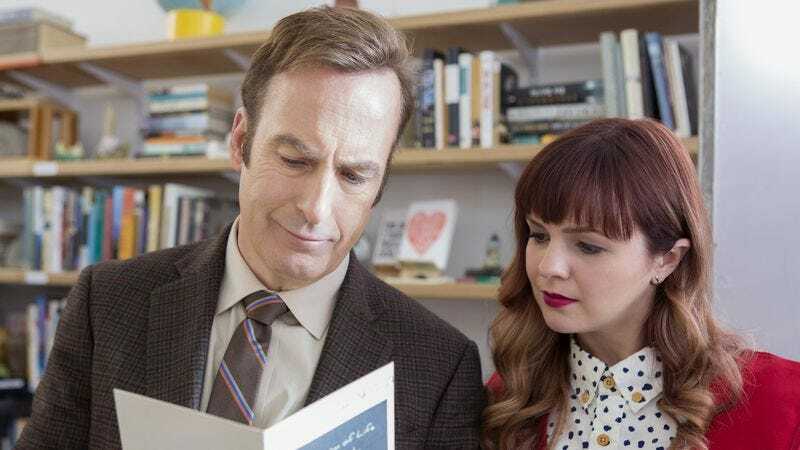 The first of two Odenkirk projects to be released both in theaters and on Netflix, Girlfriend’s Day is a noir comedy about a greeting-card writer (Odenkirk) who gets ensnared in “a web of deceit and murder.” Amber Tamblyn also stars as a femme fatale. Most interesting of all, the film is helmed by Michael Stephenson, who played the little boy in Troll 2 and later directed a documentary about the experience, Best Worst Movie. Tamblyn’s no stranger to schlock, either. While her father, Russ, is best known for his work on Twin Peaks and playing Riff in the original West Side Story, we’ll always remember him as Chocki, the half-man/half-shark savior of Cabin Boy. Actually, Cabin Boy shouldn’t be considered schlock at all, but an under-appreciated gem that both skewers and pays tribute to the Ray Harryhausen fantasy-adventure films of yore. Anyway, here’s Chocki. Say hi, Chocki! Katherine Ryan: In Trouble (Netflix): Keeping with the V-Day theme, Katherine Ryan’s latest standup special takes on topics such as dating younger men, as well as aging and Taylor Swift’s squad. The Mindy Project (Hulu): Mindy Kaling returns for the fifth-season winter premiere of her show, still nursing her wounds after getting dumped by Ben. Marah Eakin will be right by her side with ointment, tea, and a laptop upon which she‘ll write her regular reviews. You Me Her (Audience, 8:30 p.m.): The show’s first season told the story of a couple looking to spice up their relationship by opening it up to a third person. You know what else would spice up the series? Commas! Anyone with a half a brain knows it shouldn’t be You Me Her, but You, Me, Her. Or, if the producers wanted to get more declarative, You. Me. Her. If you can get past that egregious grammatical error, the second season returns tonight. Forged In Fire (History, 10 p.m.): This competition on The History Channel sounds promising: Four master bladesmiths are each tasked with recreating a historical sword on every episode, then critiqued by a panel of necromancers… er, judges. The third season wraps up tonight. Noisey (Viceland, 10 p.m.): Viceland ends the second season of its flagship music program, heading to the impoverished Nigerian state of Lagos to check out its unique music scene. Secrets Of The Underground (Science, 10 p.m.): In The Science Channel’s new series, “scientist and tech fanatic Rob Nelson travels the country to investigate long lost, subterranean phenomena.” The first episode kicks off with an exploration of Al Capone’s secret network of underground tunnels in Louisville. That could be interesting, but at the same time, is another Prohibition-era escape tunnel used by Al Capone all that unique anymore? We’ll see. Twin Peaks (Netflix): Obvious, we know. But with our mention of Russ Tamblyn and the series’ revival on May 21, it’s a great time to revisit the original or check it out for the first time. Or you could just get your Tamblyn fix by rewatching the Cabin Boy trailer.